Getting Things Done – the Right Way ! Getting Things Done by David Allen is a revolutionary book, it became a cult soon after it was published and acquired a place in pop culture as GTD (short of getting things done), which its popularly known today. The book suggests an outline for getting control of your life through the five stages of mastering workflow/mindflow: collection, processing, organizing, reviewing and doing. It has been a little over a decade since its publication and the GTD method has been quoted, recycled and talked about so many times since its inception that it has now seeped into the public consciousness, somewhat obvious to most of us, and yet most of us forget to use this wonderful method to empty our minds on to a tangible platform to get things done! 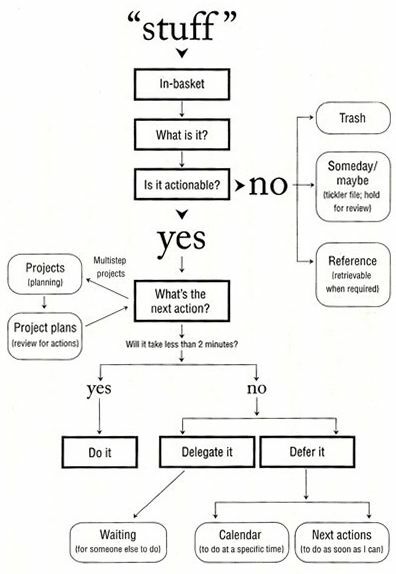 Although the book has about 13 chapters altogether, and is fairly long book, but luckily you don’t have to spend too much time revisiting or reading how to apply GTD to get maximize productivity because the author himself has provided a flowchart of actions, so the book also lives up to its teaching of avoiding wastage of mental resources to free up time for more important tasks at hand. Already off to a good start! Simply start with taking some time out, gather a notepad or anything else to write upon, just empty your mind of things at the top of your mind as tasks to be done. After you have written those down, simple recall the flowchart or look at it (attached below). 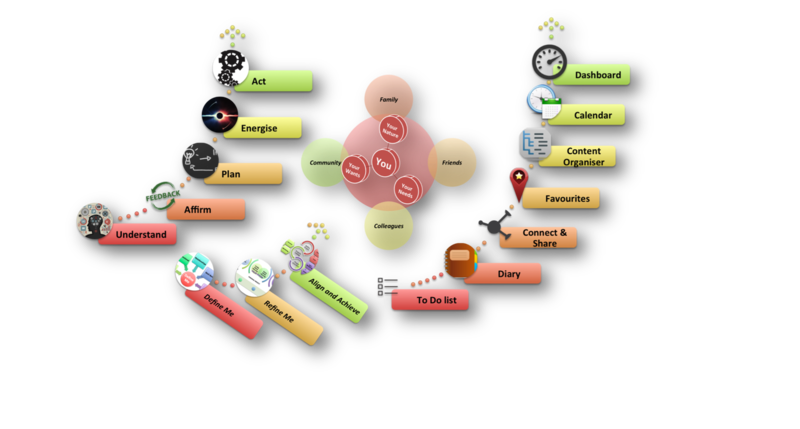 Examine each task by running it through the steps of the flow chart and render it a priority. One of the big reasons why this method works so seamless is because of a phenomenon called Zeigarnik Effect, which is the tendency to experience intrusive thoughts about an objective that was once pursued and left incomplete (Baumeister & Bushman, 2008). Because a task has been given a relatively higher priority in your mind, it keeps popping in your mind, just as when an app is opened on your mac pc and the the app icon bobs up and down till you give it attention by clicking on it. It can bother and distract you from your current task. One you align your thoughts with actionables, your mind simple frees the space to be more productive. Start with collection, gather all the tasks that have to be completed. You can any collection tool of your choice, a notepad, an app, email or whatever suits you. The book mentions three “collection success factors”: 1. Every open loop must be in your collection system and out of your head. 2. You must have as few collection buckets as you can get by with. 3. You must empty them regularly. Then comes the processing stage, which is mostly running the task through the flowchart to determine its urgency. In the Organize stage, the author describes eight categories of reminders and materials: trash, incubation tools, reference storage, list of projects, storage or files for project plans and materials, a calendar, a list of reminders of next actions, and a list of reminders of things you’re waiting for. The fourth stage is reviewing, which is go back at a scheduled time every week or day, to look at the aligned tasks. The fifth and the most important step is DOING, here he talks about the 5 phases of project management. Defining purpose and principles — In defining purpose, one asks “why?” Answering this question provides the following benefits: it defines success, creates decision-making criteria, aligns resources, motivates, clarifies focus and expands options. Principles create the boundaries of the plan and define the criteria for excellence of behavior. Outcome visioning — A vision provides a picture of the final result. Allen discusses the Reticular Activating System within the brain and how it acts like a search engine. In defining the desired outcome, this filter in the brain brings to one’s attention those things that match the vision. In addition, Allen states that you won’t see how to do it until you see yourself doing it, and his advice is to view the project from beyond the completion date, envision “WILD SUCCESS”, and capture features, aspects, qualities you imagine in place. Brainstorming — Brainstorming identifies how one gets from here to there through the generation of lots of ideas. Allen recommends writing down these ideas to help generate many new ones that might not have occurred had the brain not been emptied by writing down the original ideas. Writing ideas down also provides an anchor to keep one focused on the topic at hand. This idea of writing to spur thinking has been labeled as “distributed cognition”. Keys to effective brainstorming are: don’t judge, challenge, evaluate, or criticize; go for quantity, not quality; and put analysis and organization in the background. Organizing — Allen describes the key steps to include: identify the significant pieces; sort by components, sequences and/or priorities; and detail to the required degree. Identifying next actions – Author states that a project is sufficiently planned when every Next Action has been decided on every front that can actually be moved on without some other components having to be completed first. Now you are wondering how all of the above sounds like a lot of work, and wishing there was a ready made solution to this problem as well, that is exactly what the people at laywi.com thought, before they came up with the design for a website that does exactly that. An application that holistically helps its users plan and achieve their goals and tasks, using a scientific backing? LAYWi is the answer to all of your planning and goal management needs. LAYWi is a new age personal development website that helps you prioritize, organize and get things done. www.laywi.com has an inbuilt project management/development system that lets you define principles/values, define your vision, clarify your strengths and weaknesses using a SWOT analyses of all important areas of one’s life, and most of all it organizes all your main areas into one place, easily reviewed on everyday basis. Plus it has tools such as To-Do Lists, checklists, diaries, storage for all your important documents and a section to retain all your favorites’ in any given category. It is a one big digital solution for all your life organization, planning needs. Its free, accessible, user friendly and has been designed to let you live your life to the fullest capacity possible. Sky is the limit for those who want to aim! This entry was posted in Uncategorized and tagged apps, David Allen, dreams, goals, GTD, Laywi, personal development, plans, Posted in Uncategorized, Storage, SWOT, to-do list, www.laywi.com. Bookmark the permalink.